This power reclining sofa with a console between the reclining seats can be used as part of a sectional or as a stand alone sofa. Smaller in size ( 78") you can use this sofa in many small spaces where a reclining sofa is desired but room doesn't permit. 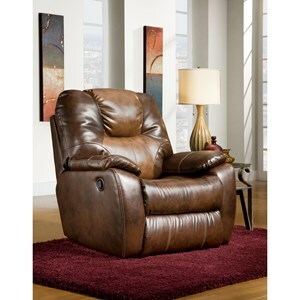 Enjoy the comfort of the well padded design in your living room, family room, great room or basement. The Avalon Power Reclining Sofa with Console by Southern Motion at Hudson's Furniture in the Tampa, St Petersburg, Orlando, Ormond Beach & Sarasota Florida area. Product availability may vary. Contact us for the most current availability on this product. 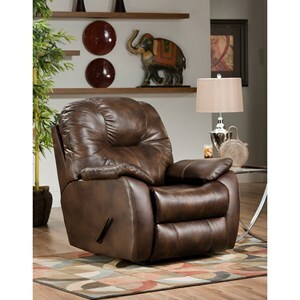 Recliner Mechanism Thick gauge steel with longlife rivets that stand up to the most demanding use. Frame Construction Hardwood frame with extra strong hardwood components. Padding & Ergonomics 1.8 lb density, 28-pound compression and fiber-wrapped seat cushions for unbelievable comfort now and years from now. Polyester fiber filled backs. Warranty Limited lifetime warranty on black metal patented parts of reclining mechanism. 5 years on wooden frame, springs, sleeper mechanisms and mattresses. 1 year on foam, seat cores, motors wiring, hand wands, fabric and leather. The Avalon collection is designed for hours of sitting comfort. Its plush headrest, deep seat, fully cushioned chaise-pad ottomans and dual reclining action give this reclining furniture a comfortable style that will warm up any room. The cushions feature 1.8 density foam with unbelievable 28 pound compression. Quality is built right in. The hardwood frame with extra-strong hardwood components is built for durability. The reclining mechanism has thick gauge steel and Longlife™ rivets that stand up to the most demanding use. A great gathering idea for your family room, great room, living room or basement. The Avalon collection is a great option if you are looking for Contemporary furniture in the Tampa, St Petersburg, Orlando, Ormond Beach & Sarasota Florida area. Browse other items in the Avalon collection from Hudson's Furniture in the Tampa, St Petersburg, Orlando, Ormond Beach & Sarasota Florida area.